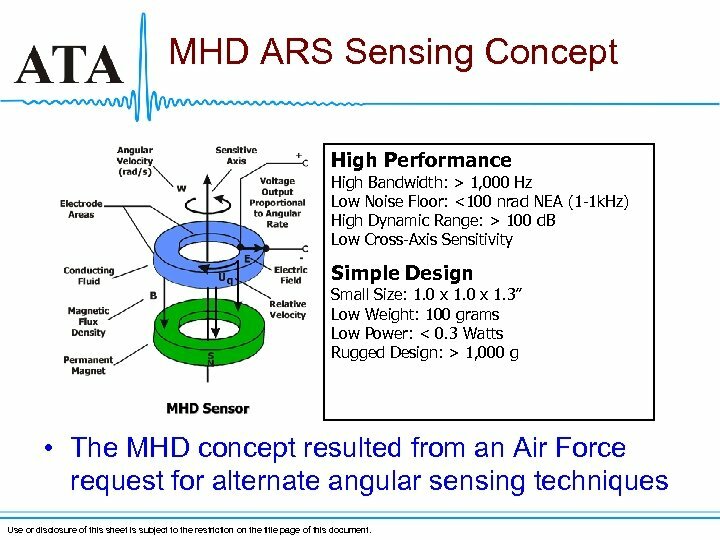 MHD ARS Sensing Concept High Performance High Bandwidth: > 1, 000 Hz Low Noise Floor: <100 nrad NEA (1 -1 k. Hz) High Dynamic Range: > 100 d. B Low Cross-Axis Sensitivity Simple Design Small Size: 1. 0 x 1. 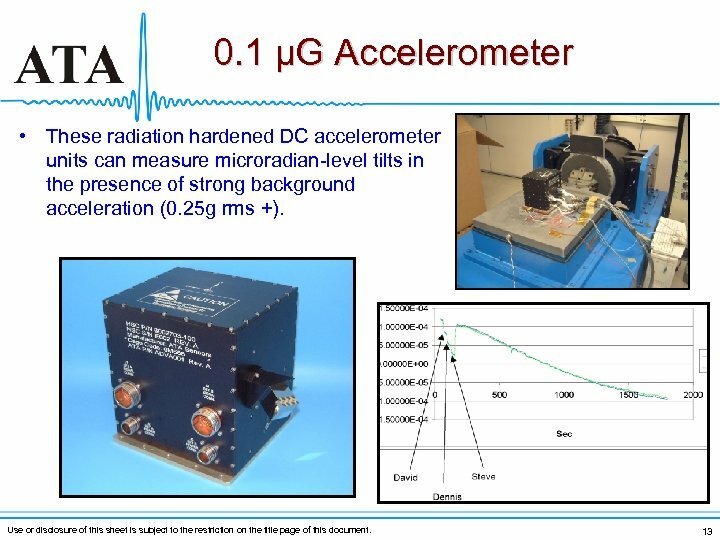 3” Low Weight: 100 grams Low Power: < 0. 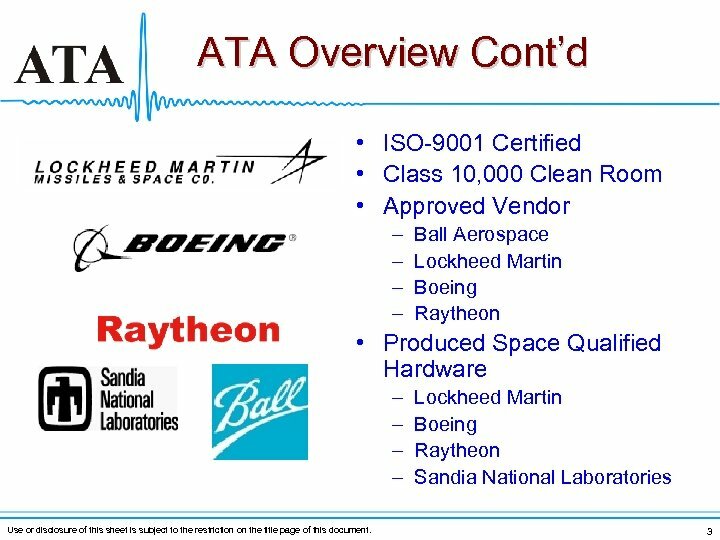 3 Watts Rugged Design: > 1, 000 g • The MHD concept resulted from an Air Force request for alternate angular sensing techniques Use or disclosure of this sheet is subject to the restriction on the title page of this document. 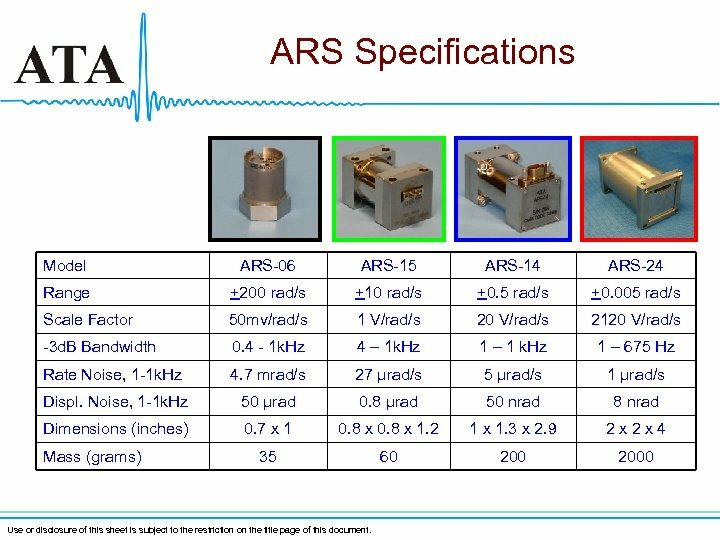 ARS Specifications Model ARS-06 ARS-15 ARS-14 ARS-24 Range +200 rad/s +10 rad/s +0. 5 rad/s +0. 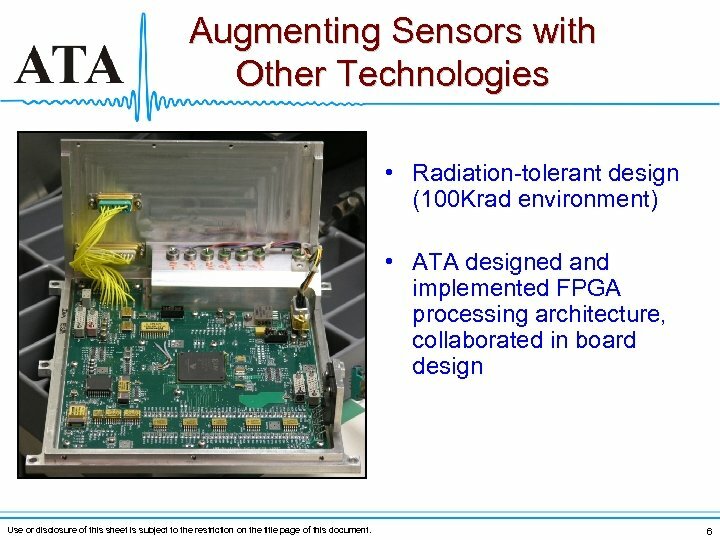 005 rad/s Scale Factor 50 mv/rad/s 1 V/rad/s 20 V/rad/s 2120 V/rad/s -3 d. B Bandwidth 0. 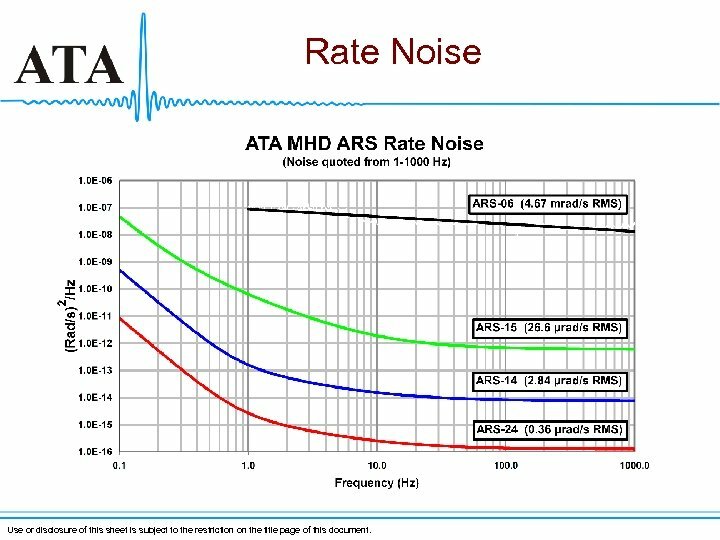 4 - 1 k. Hz 4 – 1 k. Hz 1 – 1 k. Hz 1 – 675 Hz Rate Noise, 1 -1 k. Hz 4. 7 mrad/s 27 μrad/s 5 μrad/s 1 μrad/s Displ. 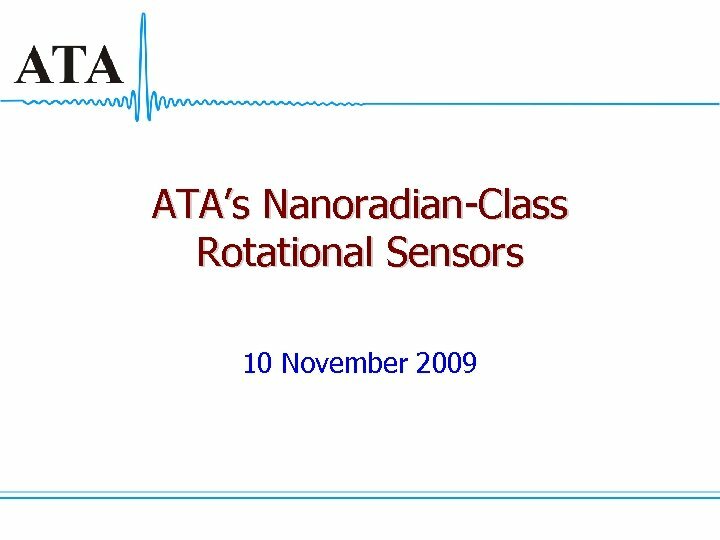 Noise, 1 -1 k. Hz 50 μrad 0. 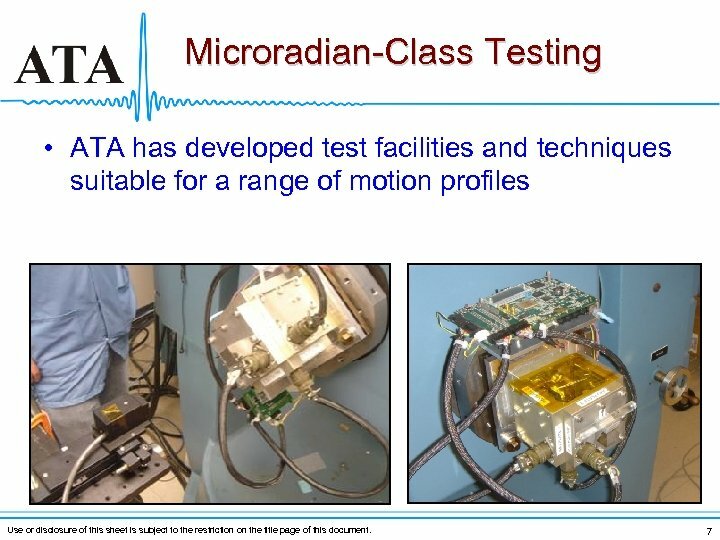 8 μrad 50 nrad 8 nrad Dimensions (inches) 0. 7 x 1 0. 8 x 1. 2 1 x 1. 3 x 2. 9 2 x 2 x 4 35 60 2000 Mass (grams) Use or disclosure of this sheet is subject to the restriction on the title page of this document. 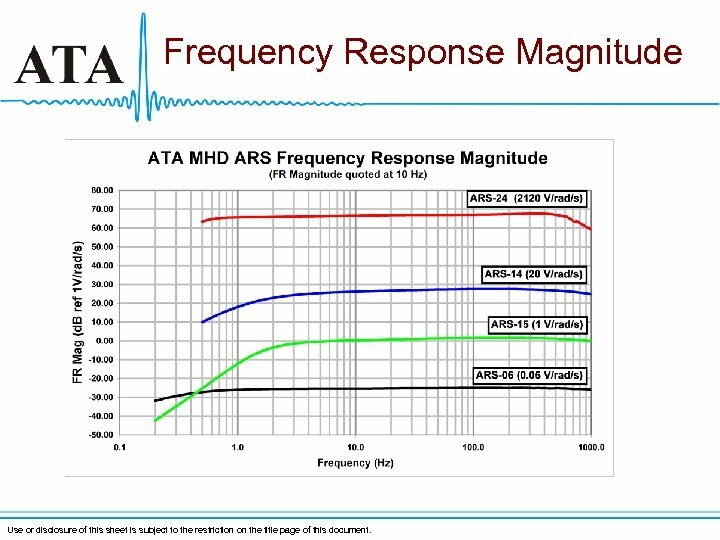 Frequency Response Magnitude Use or disclosure of this sheet is subject to the restriction on the title page of this document. 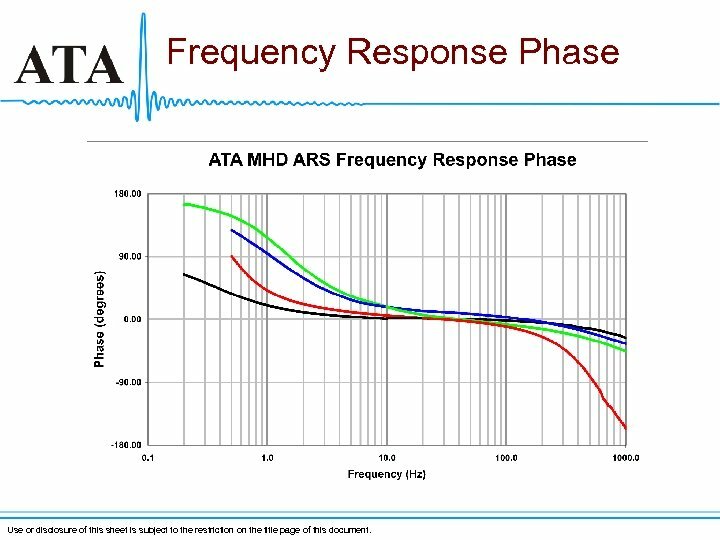 Frequency Response Phase Use or disclosure of this sheet is subject to the restriction on the title page of this document. 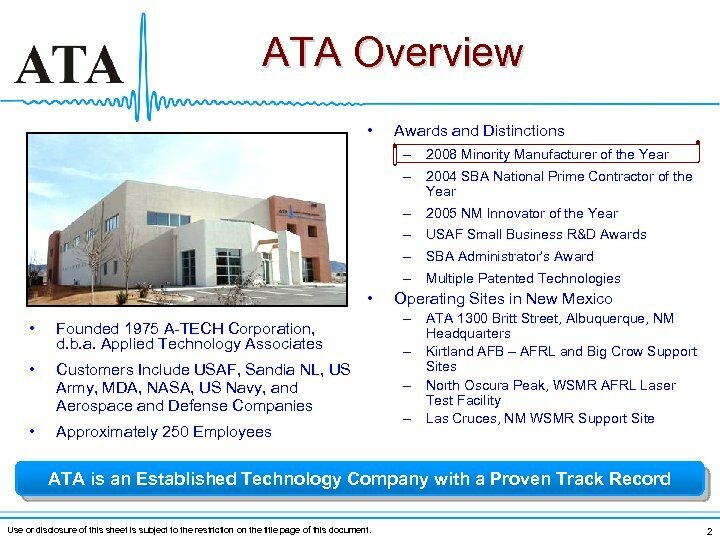 Rate Noise Use or disclosure of this sheet is subject to the restriction on the title page of this document. 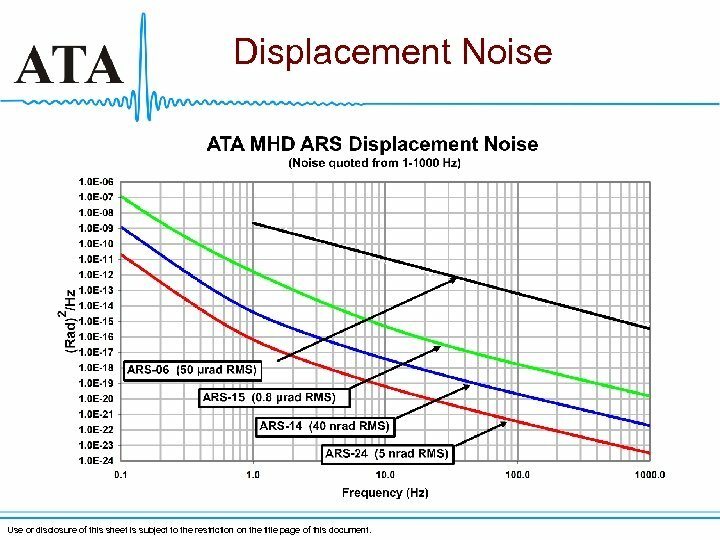 Displacement Noise Use or disclosure of this sheet is subject to the restriction on the title page of this document. 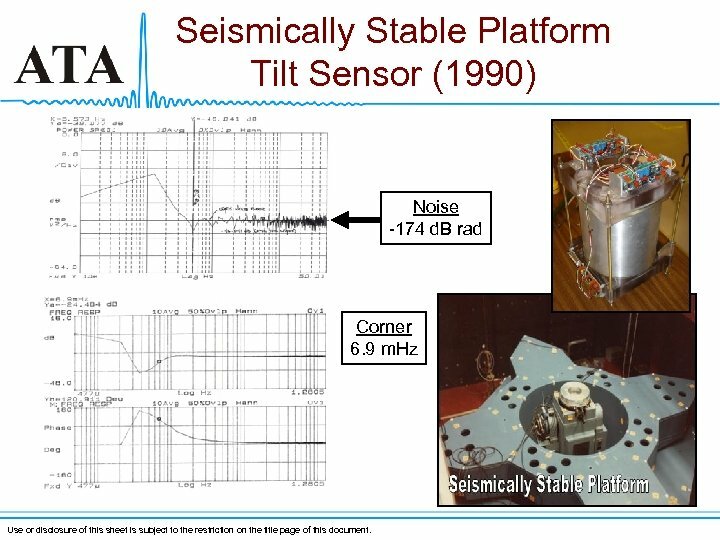 Seismically Stable Platform Tilt Sensor (1990) Noise -174 d. B rad Corner 6. 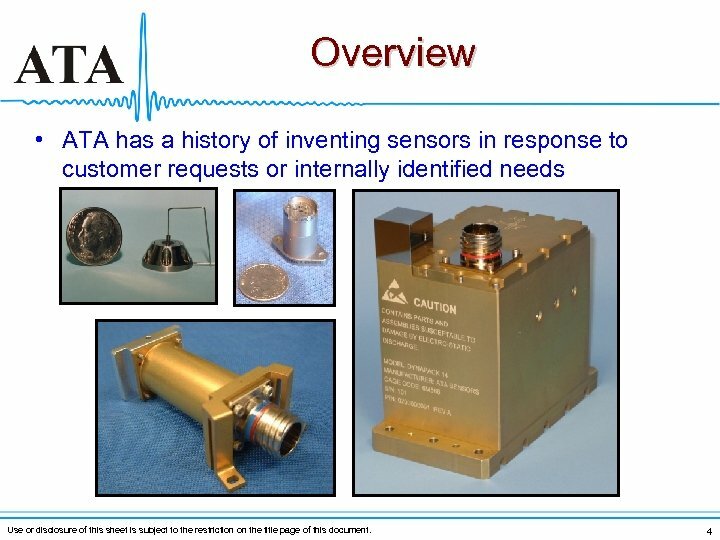 9 m. Hz Use or disclosure of this sheet is subject to the restriction on the title page of this document. 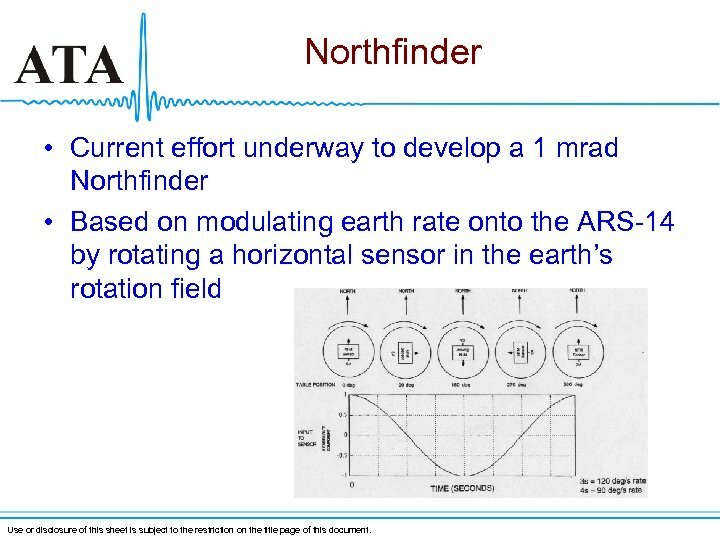 Northfinder • Current effort underway to develop a 1 mrad Northfinder • Based on modulating earth rate onto the ARS-14 by rotating a horizontal sensor in the earth’s rotation field Use or disclosure of this sheet is subject to the restriction on the title page of this document.